It was Sigfridson who designed and produced the colorful array of costumes worn by the animated characters, and who also covered the many animal figures in rayon plush fur. 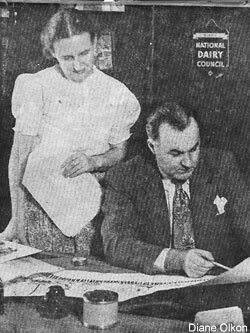 Perhaps the most notable member of his team was Lenore Sigfridson, whom Olkon hired in 1944. A Minnesota native born in 1895, Sigfridson taught for many years in rural schools throughout the state. During World War II, she was a welding inspector in a munitions plant in New Brighton, MN. Although she had no artistic training when Olkon hired her, she demonstrated great creative skill and versatility, soon becoming his production supervisor. 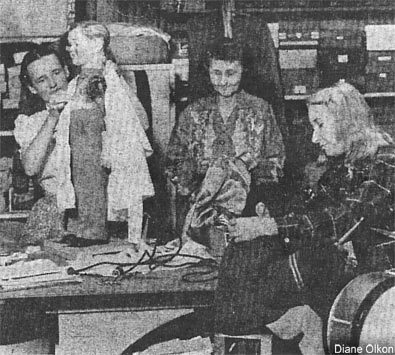 Early newspaper photo showing Minnesota workshop with: (left to right) Frances Mahr, Lenore Sigfridson and Florence Michaud. pre-war sales volume, and Olkon turned to the amusement industry as a market for displays. In addition to a shift in the product line, he also began exploring other avenues of trade for the company. Having an interest in the tourism industry, he decided to enter it, beginning with a relocation of ADC to Florida in 1956 where he opened "Anirama", a museum of animation in (as he later described it) "a part of Biscayne that was nothing but weeds". Locating at Biscayne Boulevard and 123rd Street in North Miami, he constructed a diverse selection of animated dioramas of fairy tales, jungle and circus scenes, including an exhibit of his antique toy collection. Although the attraction was entertaining and impressive, the location would prove to be a miscalculation, failing to connect with a significant flow of tourists. After struggling for a couple of years, Olkon closed the operation and decided to take to the road and become part of the carnival industry. 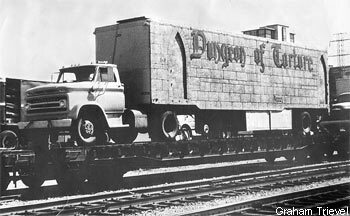 He created a show called "Dungeon of Torture", a miniature animated spectacle of medieval torture mounted in a forty-foot Fruehauf trailer. 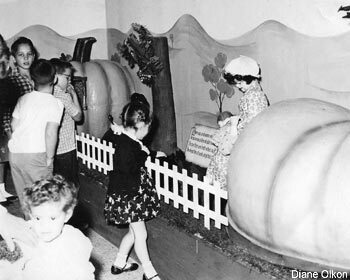 He successfully toured the attraction on the Royal American Shows railroad carnival, faring particularly well in Canada. He was accompanied by his son Ken and young daughter Diane. Ken, then recently discharged from the Air Force, handled the truck driving. Van also operated two other trailers featuring fright-oriented walk-through attractions, one of which contained built-in living quarters.